The following post and video are sponsored by NEUTROGENA. For our sponsored post policy, click here. It’s no secret that I love playing around with make-up — I honestly enjoy holing up in my bathroom with a bunch of new products or trendy techniques to try. And, while I’m certainly no pro, I apply it well enough that it’s not uncommon for friends to ask me for make-up tips and advice, which I’m only too happy to provide. Choose lips or eyes — don’t go overboard on both. For the love of Bob Harper, please take it all off at night. Every night. Yes, even if you’re really, really tired. The thing is, removing your make-up doesn’t have to be a big ol’ ordeal. 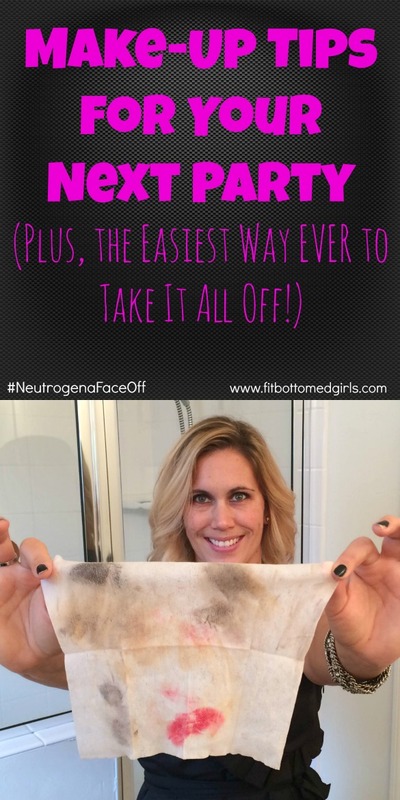 I’ve actually used Neutrogena’s Makeup Remover Cleansing Towelettes for years for that exact reason. They get it all off — even the waterproof, smudge-proof liner and mascaras that I often wear, and the practically permanent lipstick, too! And it honestly takes about a minute. It’s so easy, I just see zero reason to skip it, which is why I jumped at the chance to participate in the #NeutrogenaFaceOff experience. I already live it — I might as well share it! So, just for you guys, I’ve put together a fun video showing my applying make-up for a fun night out, then — you guessed it — taking it all off. Spoiler: Not only do you get to see my crazy mascara-applying face, but there’s also dancing. And dogs! Two lucky readers will receive a $50 Walmart gift cards, and three additional readers will win Neutrogena MoistureSmooth Color Sticks, which come in really fun, bright colors and are super easy to stash in a purse and use. Through the end of the year, Walmart is offering a Roll Back promotion on Neutrogena lip and eye products, including the Crease Proof Eye Shadow sticks, Nourishing Long Wear Eye Shadow + Built-in Primer and MoistureSmooth Color Sticks, all of which you’ll see me use (along with a number of products from my own stash) in the video. While those products were provided to me by Neutrogena, I was not obligated to use them. Enter for your chance to win (U.S. only, please) by commenting below with what color MoistureSmooth Color Stick you’d most like to add to your collection. Or, if you have an amazing make-up trick you’re just dying to share, we’ll take that, too! And, of course, you should feel free to join the conversation on social media by sharing your #NeutrogenaFaceOff experience pictures. Don’t leave me hanging, guys. What a fun video 🙂 I would love this in plum perfect. Great video!! Loved all of it…especially the dogs watching you dance. The warm caramel would be the best for my skin…although I am dying to find the perfect shade of red to add to my palette! I’ve always been a big believer in primer, but I recently discovered that Banana Boat Sport spray works as an amazing primer! I am pretty religious about applying sunscreen, and this one doesn’t make my face shiny, nor does it flake like some of the other spray on sunscreens. juicy peach looks like something I could wear everyday! I really enjoyed watching your video.! So fun. I will most definitely be adding this wipes to my stash. I like the Warm Caramel color. This is great. I hope I win!! Great video! Would love the warm caramel color! Warm caramel is my favorite! I’d like to try the rich raisin. I loved the red you applied in the video, but can’t decide which color you were using! I would love to try any one of the eight beautiful colors! I’d love to have the Juicy Peach shade! I think Plum Perfect would go best with my skin tone. Thanks for the giveaway! I love all the colors but Juicy Peach would be perfect. I want to try the juicy peach color. My make up trick since I’m older & eyelids are slightly drooping, take eyeliner from center of eye (on eyelid) to end and also the shimmer or highlighting portion of your eyeshadow to center along edge of eyebrow/eyelid down & keep close to eyebrow making sure not to get too much on eyelid. Helps to focus on eyes not droopy hooded eye lids. Sweet watermelon looks like the perfect pink! Fresh papaya seems like a perfect pink, but not “too pink” shade. My tip isn’t really a tip per se, but I cannot live without eyelid primer ever since I discovered it. It has made the difference in keeping my eyeshadow on all day, which is a big deal when you have oily lids. Even if you don’t have oily lids, you may find that your eye makeup starts to wear off and slide by the end of the day and eyelid primer like the one from Urban Decay totally helps with that.